Zakaria Hersi is one of those fortunate people who has been able to stitch his vocation and avocation together seamlessly in his quest to achieve success – on his terms. On one hand, he’s a tech innovator and entrepreneur whose creativity has earned him awards and accolades on two continents – Europe (Sweden, to be more exact) and Africa (eastern, and in countries like Nairobi, his native Somalia and Mauritius). On the other hand, he’s a zealous engineer of social change. Those two passions have combined in his latest business, Orten.io. Orten.io is a Swedish based enterprise that aims to open doors to create a better understanding of how diversity can benefit the nation’s tech startup community. 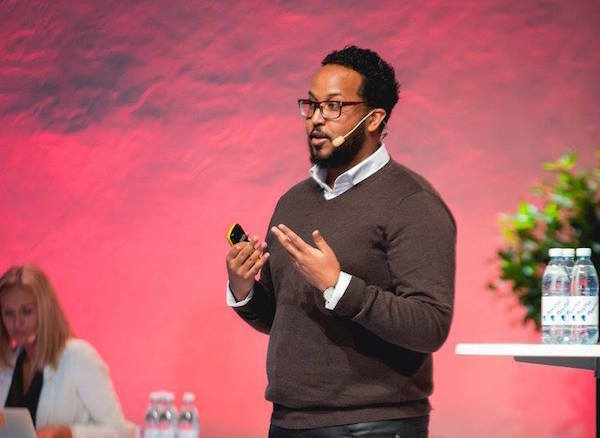 “I am building a platform that will serve as a bridge between the tech community and underrepresented populations that have huge potential to help tech thrive – given the right support,” says Zakaria Hersi. To that end, Orten.io attacks the issue from two angles: Startup events that promote tech entrepreneurs with diverse backgrounds and educational programs and workshops for promising individuals who may be economically disadvantaged or from female and minority groups. Zakaria himself has been what he calls a “reject of Sweden’s job society” as a Somali native whose family immigrated to Sweden when he was seven. That was an instrumental driver of his first entrepreneurial venture with two similarly disenfranchised friends. The team launched a business intended to commercialize the theory behind real time data compression. The business gave Zakaria important exposure to issues any entrepreneur needs, like finding and working with mentors and where to go for funding and how to pitch to get it. Zakaria continued to learn however he could, working for free on more than one occasion as a means to learn about different business and geographic markets and to expand his professional network. Yet, even as he grew his credentials and contacts to help other emerging tech players grow, he was cutting his own entrepreneurial teeth and finding ways to make the startup ecosystem a more inclusionary proposition. That’s what motivated Zakaria Hersi from the beginning and continues to do so today. In finding ways to bring his altruistic and business interests together on behalf of the broader tech startup community, he’s ensuring that everyone wins. It has been ten years since your first experience with your friends as a “reject of Sweden’s job society.” Has the situation with the country’s tech startup community improved since then or not? What advice would you give other minorities in Sweden (or elsewhere) on breaking through? [Zakaria Hersi] My advice to other minorities is never to doubt their own abilities because of the rejections they receive and to see themselves as assets. What helped me is getting out and going to network events, meeting other people, and realizing CEOs are humans too. I could do their job, if you just work hard for it and work so hard they can’t ignore you. You worked for free for the Swedish Trade Council and later for Coursio, long past the age and the experience level of the typical intern. Is this an approach you would recommend to others as a means of breaking through in a difficult job market? Why or why not, and would you do it again? First one for Swedish Trade Council in Nairobi, Kenya was to learn and start from the very bottom. When I got an opportunity to cold call and work as intern for the Swedish Trade Council, it was one of the top 10 employers for graduates. I saw it as an investment to gain experience and something that was very valuable. Coursio was different case. This was after so much rejection in the Swedish job market, and the possibility to work for free in a startup, I saw as a way to get my dignity back, feeling needed again and motivated. How challenging is it to build support for an entity like Orten.io that’s not in the model of a typical entrepreneurial venture? What measures will you use to validate your success? Can you see expanding the concept beyond Sweden? It is a huge challenge as this is creating a huge impact in social terms in Sweden, but also its a for profit entity. This type of focus is usually classed as NGO work, but it has never been done within tech. To use people affected by high unemployment and who have been rejected by the job market and to give them new skills and teach them coding and get them back into the market as techies – that’s Orten.io’s goal. We measure the amount of people who show up to our events, PR mentions, interest in applications and also, later on, job placement. Our goal is to create 1,000 developers by 2020. Hopefully, we want to launch in London, Paris and Berlin . But, we on the right path, as we just won Best Startup Ecosystem Initiative in Sweden, which shows the impact we are making on the ecosystem in a short period. The tech community around the world has been coming under heightened criticism for its lack of diversity. And yet its members seem to be making slow progress in addressing it. What is the long-term price the sector is going to pay for this? Are the measures being taken – like hiring female, minority diversity executives – sufficient to the challenge? What are the fundamental changes that have to be made, and do you think that will happen in our lifetimes? The long-term price is these tech communities will lose their dominance in attracting such talents. Beijing and China are great examples of how they will leapfrog Silicon Valley soon. They have a track record of having female CEOs. 20 % of large companies in China have female CEOs, which is 14% more than the U.S. This creates better companies and better ways to attract talent. There are measures being taken, but I don’t think it’s being done fast enough. We also need to fix not only the pipeline of finding them, but retaining them. Female and people from minority groups have a high percentage of leaving the workplace within a year or two because of the lack of diversity in the company or the internal culture.